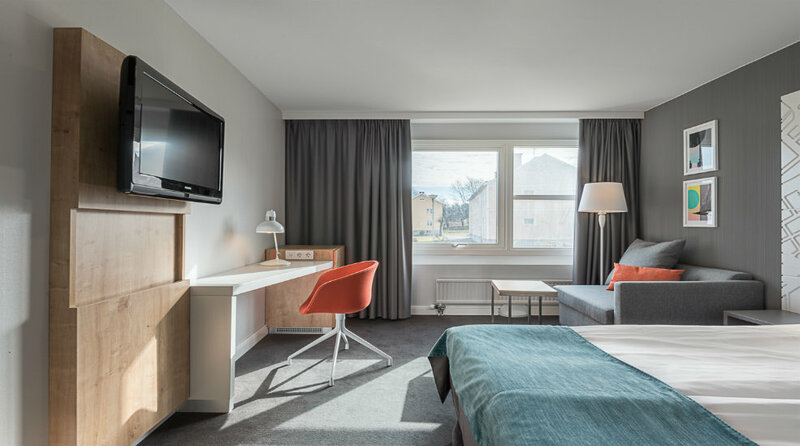 The Quality Hotel Prisma is a modern conference and family hotel in the heart of Skövde. Situated just next to the Boulogner Park, you'll be within easy reach of transport links, the main shopping street and restaurants. This is a cash-free hotel. The Quality Hotel Prisma is a family and conference hotel, conveniently located in central Skövde within walking distance of Skövde City where you'll find a good range of shops and restaurants, as well as the central train and bus station. The Quality Hotel Prisma is beautifully situated next to the Boulogner Park, a green oasis in the heart of Skövde. Tourist attractions such as Lake Hornborga, Läckö Castle and Skara Sommarland water park are all within easy reach of the hotel. The Quality Hotel Prisma is a cash-free hotel. This provides added security for our guests and visitors as it reduces the risk of theft and burglary. More information about this can be found under FAQs. Guests are welcome to park in our garage free of charge, subject to availability. You can also park for free on the street just in front of the hotel. The hotel's modern and flexible conference facilities can accommodate up to 80 people. Our staff are more than happy to assist you in planning both large and small events. You can order soft serve ice cream and popcorn at any time during your conference to keep participants going during a long day of meetings! We have a charming restaurant where you can enjoy good food and beverages. We serve breakfast, lunch and dinner in pleasant and stylish surroundings. Just sit back and relax while our staff look after you. Sweet Dreams Stay is a collaborative project with UNICEF, helping children affected by human trafficking get a safe night's sleep. To contribute to the project, we only clean your room if you request cleaning when you stay two consecutive nights or more at the hotel. We will donate 10 SEK to UNICEF for every room that we do not have to clean. This will also help to reduce the use of chemicals, energy and water. Together we can make a difference! Find out more about Sweet Dreams Stay here. We are pleased to be able to offer reduced rates to guests as part of sporting events, matches or races. With comfortable beds and flexible check-out/in times, you're all set for a good night's sleep! We also have a special sports menu in the restaurant. Read more about our offers and discounts for sporting guests. Those of you in need of some rest and relaxation should head straight to our sauna, which can be used by all our guests free of charge. Our gym is located just next to the sauna and is fully equipped with free weights, and cardio and weightlifting machines. There are also plenty of places to go for a walk or a run near the hotel. Just come to the reception and we will provide you with tips and maps. We hope to see you soon at the Quality Hotel Prisma in Skövde! Train to Skövde travel centre. Bus 4 from the travel centre, get off at bus stop Volvo B-port. The bus from Skövde travel centre takes about 5 minutes.